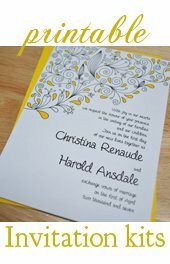 There are many ways to make beautiful and unique handmade wedding invitations. In my opinion if you want to give it that really special touch of elegance and femininity, you've got to use pressed flowers. There are so many ways to achieve this within your homemade invites. You can press the flowers by hand in a book or flowers press. You can buy pre-pressed flowers or even pressed flower stickers. 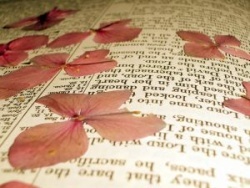 Some handmade papers already have pressed flowers mixed into their fibers. I Love to use the flowers themselves as the focal point and decorative element on each of your invitation cards. Sometimes it is a nice touch simply tucking a dried or pressed flower, or skeleton leave into an invitations's belly band or ribbon. You can buy pressed and dried flowers at many arts and crafts stores, and even online. To save money try to wait until a particular pressed flower goes on sale, or try to buy them in bulk. But if you really want to save a bundle, and you are willing to put in a little extra work, you can save a substantial amount of money by pressing the flowers yourself. Pressing your own flowers is really quite simple. Simply pick the flowers you wish to press (flat flowers work the best) and cut them all at the top of the stem to make them as flat as possible. Some flowers need to be taken apart to be pressed, then re-assembled with glue afterwards. You place the flowers between blotting sheets which is basically just thick white absorbent paper and place them in a press for a couple of days until all of the moisture has been pressed out of them. Some like to press their flowers in a large book. But if you really want to see success, I recommend using a flower press. I bought a flower press for this task but you can also make a press yourself pretty easily. All you need is two pieces of wood only about 1/4" thick and about 6 inches by 6 inches wide, or larger. You will also need 4 large bolts (about 2-3 inches long by 1/4") and 4 wing nuts. 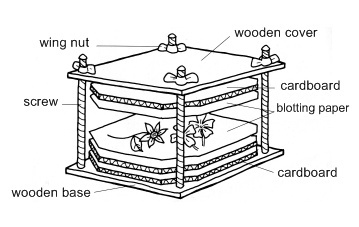 Just drill a hole in each of the four corners of both pieces of wood. Make sure the holes align perfectly when placed one piece on top of the other. To press your flowers simply place the petals and buds between two pieces of blotting paper. Alternate by placing two sheets of blotting papers (with flowers in between) with pieces of cardboard. Keep alternating until you have fit all of the flowers you wish to press, or as many as you can comfortably fit. Some even use a heavy book to press flowers in, but for a project like making handmade wedding invitations it is a bit hard to do this. It is much more practical to simply use a press. If you are not up to drilling holes and all that you can buy a flower press pretty inexpensive online. They range in price from about $9.99 to $40.00 so do shop around. 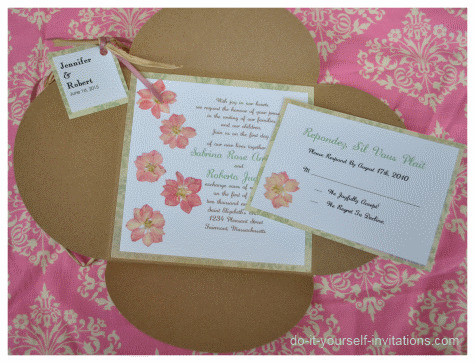 Unique petal fold handmade wedding invitations with a pressed flower cherry blossom theme. So pretty! For a fantastic array of different pressed flowers, as well as a unique flower press check out The Pressed Flower Store. Save On Crafts has a seriously affordable wooden flower press as well other pressed flower products to browse through.